UCLA Institute of the Environment & Sustainability (IoES) held the 2019 Hollywood for Science Gala in Los Angeles on Thursday, February 21. 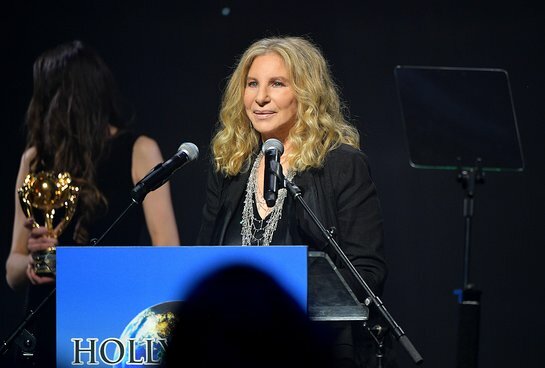 This year’s annual event honored legendary singer, songwriter, actress, and director Barbra Streisand and world-renowned super model Gisele Bündchen for their environmental activism. The event featured performances by six-time Grammy award-winning artist Ms. Lauryn Hill and Grammy award-winner CeeLo Green. All proceeds from the black-tie benefit will support IoES and all of their initiatives. Hosted by IoES Global Fundraising Chairman Milutin Gatsby along with Lawrence Bender and Alexandria Jackson, this year’s event took place at the private Bel Air estate of Jeanne and Tony Pritzker. Guests included Hollywood for Science Co-Chairs Gerard Butler, Courteney Cox, Anjelica Huston, Adriana Lima, Laurence Fishburne, Robin Thicke, Lyn and Norman Lear, Nina Dobrev, Andy Garcia, Angela Lindvall, Taylor Hill, Maryna Lunchuk and Isabeli Fontana. Additional guests of the evening include Tom Brady, Josh Brolin, Petra Nemcova, Jasmine Tookes, Julia Jones, Donna Karan, Jasper Paakonen, Josie Canseco, Todd Morgan and Rosanna Arquette, and Kevin Kwan who attended with Singapore’s most acclaimed actress, Tan Kheng Hua. Throughout the evening, guests enjoyed house cocktails made with Dobel Tequila. During an exceptionally curated auction led by star auctioneer Simon de Pury, guests bid on a variety of highly curated experiences including a trip to Nepal and a helicopter tour of Mt. Everest. Richie Akiva and 10AK hosted an after party following the evening’s spectacular events. This year’s gala was presented by Chopard.